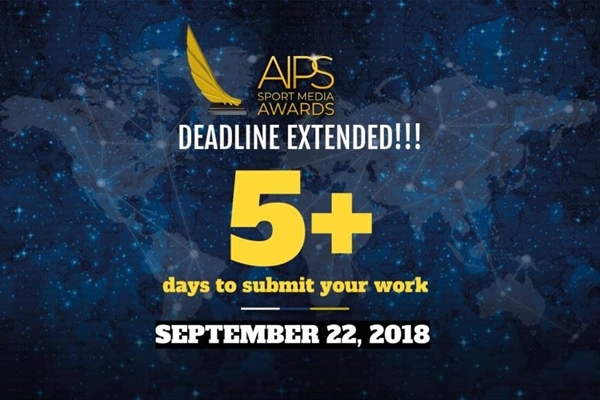 As submission deadline for the AIPS Sport Media Award was approaching, and after receiving plenty of messages asking for an extension, we have decided to offer a gift to all of you: a five-day extension. Yes, five more days to submit your work, five more days to those that still could not make a decision on which article to submit, or that were requesting some extra days to find missing pdfs, audio or video files that needed to be converted. New (and final) deadline is next Saturday, September 22nd, at 6pm (CET). The number five does not come by chance. It is a number that pays homage to the five continents, because we have received works from across the globe. As a true sign of success, there are more than 100 participating countries in the Awards' first edition, a confirmation of its global character. And all this happened just with a six-month promotion. Categories include Photography (Action Picture; Portfolio), Writing (Best Column; Best Colour Piece), Video (Athlete Profile; Documentary), Audio and Journalistic Weblog. The works will be reviewed by the Executive Committee, with the help of the national associations, and a jury of 11-respected members of the sport media industry will shortlist the 10 candidates of each category. The three finalists will be invited to Lausanne, in January 2019, where winners will be announced. Each winner will earn 8,000 US$. The second-placed will get 3,000 US$ and the third-placed, 2,000 US$. The website has added German, its seventh language after English, Arabic, Italian, Spanish, French and Russian, and certainly not the last one. Remember: submitting is completely free. A maximum of two submissions per persons are accepted. All media professionals from 160 countries are invited to participate. And now there's five extra days to complete your registration. This five-day extension was a final present on behalf of #SportMediaExcellence, the hashtag that has been inspiring on us on our Twitter, Facebook and Instagram accounts (@aipsawards) through our Media Tribune, Game Changers and Editor Speaking sections.